You are here: Home / branding / How long does it take to do a headshot? How long does it take to do a headshot? What goes into a Sydney studio headshot session? That question is often asked, and the answer is, it depends. Headshots and Branding Photography covers a range of different ideas. There are lots of reasons for getting a headshot done, and just as many ways to go about it. For many people in the corporate world, they may be after a simple headshot for their LinkedIn profile or website. It may be because they are about to look for a new job, or because they got a new role at work. These are the simplest type of headshots that we do in the Coogee studio. Usually you already know what to wear, it would be the same as what you’d wear to an interview. With the right planning in place, we can get the photographic shoot done in under an hour, and then select the photographs together in about 30-45 minutes. What could be easier? So what do people usually get? Here is a sample session with Lianne, with the photographs she chose. Lianne is a marketing professional, who just got a promotion at work (congrats!). She needed a new shot for LinkedIn, and a couple of matching shots for website or newsletter use down the track. We discussed on the phone the different ways we would use these photographs. We discussed the expressions she wanted to convey, and whom the audience would be for each of the shots. We talked about what she would wear. Because she was in marketing, we wanted to stay away from the usual suit dress. We decided to have two different dresses, and a jacket we could use to turn into four different looks. We knew exactly what we needed, even before coming in for the session. We did a few standing shots with and without the jacket. Then we used the stool to make some different looks which would be more engaging, but still simple and clean. In the end, we liked the blue dress without the jacket. The muted colors worked very well with her professional but creative look. We chose to use the red dress with the jacket, for a more corporate look. This could be used in more conservative publications or on different profile sites. And of course she also got the handcrafted monochrome versions of the photographs. In the digital age, everyone has a camera. Everyone can take a photo. Everyone knows someone with a nice camera. Why go to a professional? I guess it’s the same as taking someone out for a meal. If you were taking out a new prospective client to a business lunch, you could take them to your home and cook, to McDonald’s, or to a nice midrange restaurant. Each would leave a different impression on the client. One would be a bit weird and uncomfortable, one would feel a bit cheap. And yet some people do the same thing with their profile photograph. Your profile photograph is your first impression. It gets processed before they even read your bio. Do you want that impression to be that you’re trustworthy competent professional? Or that you couldn’t be bothered spending less than two hours to get a proper headshot done? 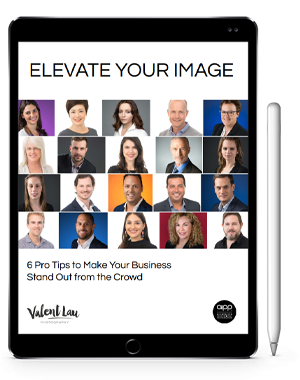 Now that you know how effortless getting a professional headshot can be, what will you do to promote your business? Valent Lau Photography provides Professional Headshot Photography in our Eastern Suburbs studio or at your Sydney location. Contact us now and let us help you make your best first impression. Valent was initially recommended to me by another photographer for the techniques he uses. Even so, when I signed up for portrait photos, I was apprehensive. I really dislike having my photo taken. He made me feel very comfortable and the finished product exceeded my expectations. It really helped that he showed me some of the shots along the way, and had lots of helpful creative ideas. I wouldn't hesitate to recommend him.